Galerius, his laureate and cuirassed bust right. holding patera in right above altar, and cornucopiae in left hand. B in right field. PLC in Exergue. The image below was photographed by Andrew Thall. The image above is my own scan. Sutherland, C.H.V., "Roman Imperial Coinage", Volume 6 (RIC), Lugdunum, p252, nr 164b. hinterlassenen Sammlung und Aufzeichnung des Herrn Paul Gerin" (Voetter-Gerin), Lugdunum, Galerius Maximianus, p173, nr 17. 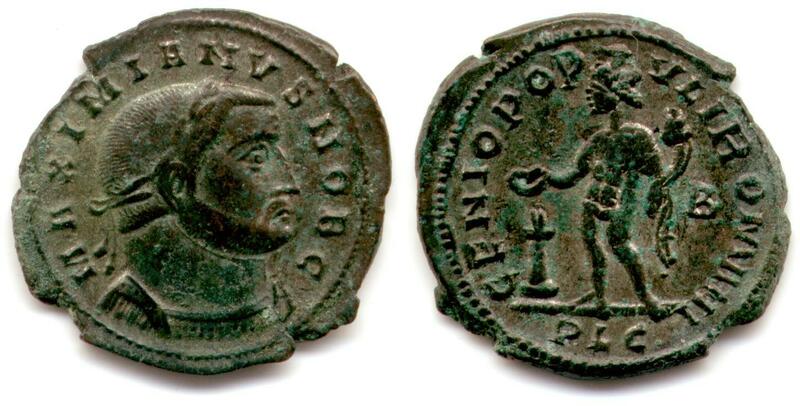 Van Meter, D., "Handbook of Roman Imperial Coins", p281, nr 31.